Lencrow Group and Sure Sweep have released the SM900 pedestrian sweepers. These units have all the advantages of pedestrian sweepers such as, low maintenance costs, low noise, easy for any staff member to use. It also has the added advantage of battery vacuum which improves dust control and collects more fine particles which stops them being returned to the work atmosphere promoting a cleaner and healthier work place. The unit’s robust construction makes them virtually indestructible. The dirt collection hopper is made from high density rust free plastic and has a generous 50 litre capacity. 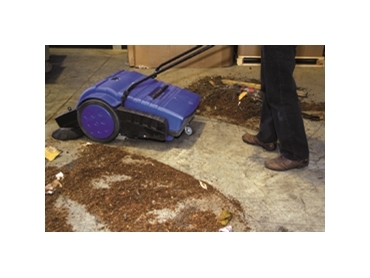 The sweepers TRS sweeping system is cutting edge and is fitted with long life polyamide brushes. The SM 900 smooth running makes them suitable for surfaces like concrete, asphalt, carpet and vinyl. The unit has a 900mm sweep path with two side brooms, giving an impressive 3150 sq. m/hour making even big jobs seem small.